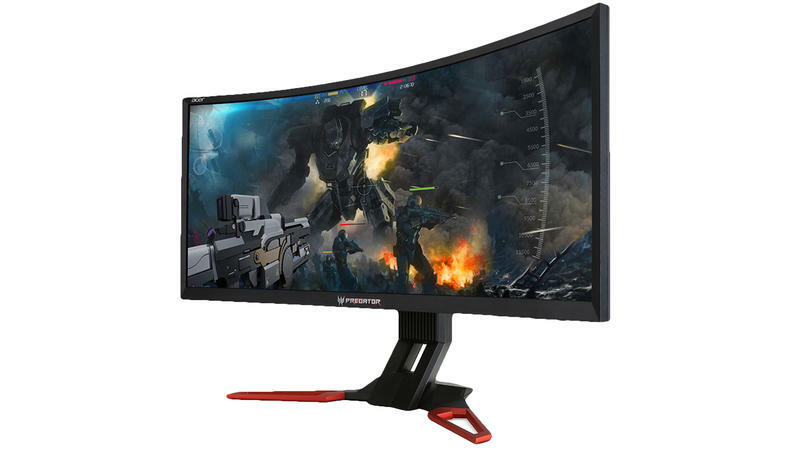 Acer just added what seems like an awesome entry to its monitor lineup, the Predator Z35, a 35-inch UltraWide display with a curved panel, G-Sync support, and up to a 200Hz refresh rate (via overclocking). We always take these things with a grain of salt, but for what it's worth, Acer rates the contrast ratio at 3,000:1 (native) and brightness at 300 cd/m2. The panel also promises 100 percent coverage of the sRGB color space, and if that claim holds up, designers and photographers might join gamers in showing interest in the Predator Z35. There's a lot to like when running down the list of features, like a futuristic design with underglow lighting (you can adjust the ambient lighting through the on-screen display menu), a stand with ergonomic tilt (-5 to +25 degrees) and height adjustments (up to 5 inches), a cable management hole for keeping cords from cluttering up your desk, blue light filter (if you care about such a thing), and built-in 9W speakers with Dolby DTS. On the connectivity front, you'll find HDMI and DisplayPort 1.2 inputs, and four USB 3.0 ports. "We're thrilled to bring the Predator Z35 to our customers in the United States," said Charlotte Chen, Acer America product manager. "This state-of-the-art gaming display offers one of the most exciting visual gaming scenarios available today. We believe the combination of super smooth action play, lifelike images and powerful audio will put this on the wish list of even the most ardent gaming enthusiasts." Even the price is reasonable for a 35-inch display at $1,100 MSRP (I paid more for my 30-inch monitor several years ago). So what's the catch? It's the 2560×1080 resolution. Some will find the limited vertical space a deal killer, others won't. If you fall into the latter category, keep your eyes peeled — Acer is uncaging the Predator Z35 sometime this month.